What red blooded male wouldn’t like to wake up to Keira Knightly in stockings on Christmas morning, well here’s the next best thing… well almost, how about a 1/6 figure of her in your stocking? 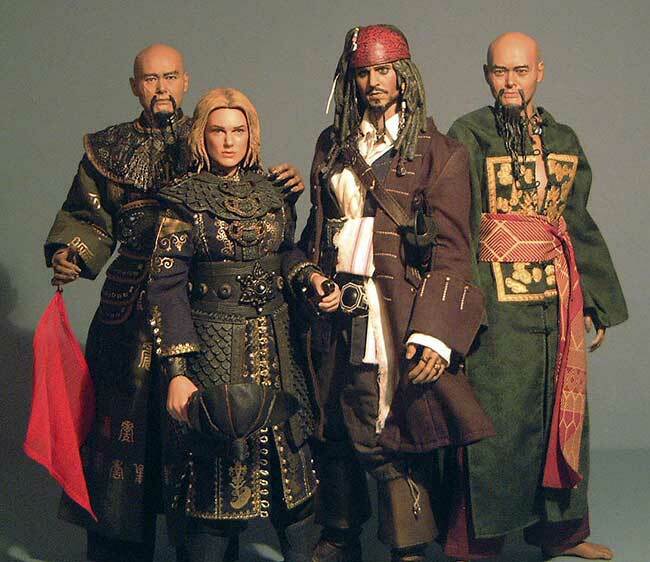 Hot Toys (HT) Pirates of the Caribbean (POTC) is shaping up to be one of their most impressive lines. We’ve already had one very nice Jack Sparrow with what looks like an even better one on the way, if you haven’t already checked out the Cannibal Jack sculpt, go do it, it looks peachy! http://com5.runboard.com/bmedicom.f14.t12733 . With the first Jack we got Sao Feng Version 1 reviewed and now comes Sao version 2. I think a few people were mystified as to why we got two versions of Sao so quickly before getting onto some of the more major characters. 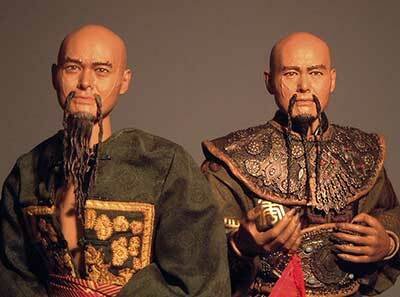 Well firstly, as far as I can make out Sao V: 2 is a very limited edition, Blister exclusive (thank the gods for eBay) and secondly Hot Toys is a Hong Kong based company… do you have any idea how popular Chow Yun Fat is in China! And lastly but by no means leastly we get to Keira Knightly as Elizabeth Swann, soon to be partnered by Orlando Bloom as Will Turner. Elizabeth comes in the same formatted box as the previous HT, POTC figures, so slip on metallic sleeve and flap-fronted box. 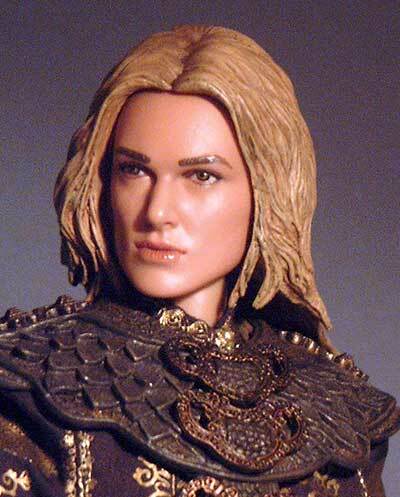 The front of the foil sleeve has a photo of Keira as Elizabeth in the movie, but all other pics are of the figure. Inside she’s in the usual vac-formed tray held in place by five twisties along side her sword, scabbard, hat and stand. Sao on the other hand comes in a smaller box with no slip on sleeve (I think he’s the first Movie Masterpiece series figure other than the Power Loader and ED209 to come without one). As Sao comes with no accessories at all, it makes sense that his box is smaller, and although he’s also made in limited numbers (can’t seem to find an exact number) he retails for quite a bit less as well. The front has a picture of the POTC logo ‘Skull and Cross Bones’, and the other panels have images of the figure. On eBay at the moment Sao V: 1 goes for anything from $110 to $160 whereas Sao V: 2 is about $95 to $105. The smaller lighter box helps keep the cost down on international shipping as well. These are two beautiful sculpts again. There haven’t been that many sculpts (if any) at this scale of Ms Knightly but there have been plenty at smaller scales and though some have been passable, none have captured her exactly, and to be fair this hasn’t captured her ‘exactly’ but it’s damn near. You can see some more cool shots over on the SSF boards here - thanks to Maulfan for those. Her face is virtually perfect; the nose is very good as is the jaw-line with its hint of under-bite and those cheekbones you could cut diamonds with. The mouth shape has the trademark Keira pout. The eye’s look like they might be a gnats whisker too far apart, but I feel bad mentioning it as it’ so very slight, and their shape is very Keira. The only thing that detracts from the sculpt is her hair. It’s expertly done and the sculpt is very close to the style she wore in the film and there’s some lovely detail on the rear where it falls down her back, with some cut through details so it doesn’t sit as one large slab, but it still doesn’t hang 100% right around her face. This is exacerbated by the fact the paint job is a little too light, and had it been about 20% darker, I don’t think it would have been as noticeable. 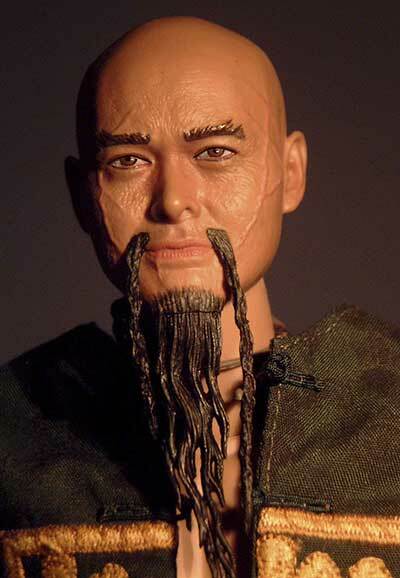 Now onto Sao, this is even better than the last version and I thought that was spot on, this version has a more relaxed expression and the likeness to Chow Yun Fat is made more apparent, the main difference, other than the obvious facial hair, is around the eyes, Chow Yun Fat has in my opinion got a very friendly and welcoming face and that comes across much better in this version. The positioning of the facial scaring has altered slightly as well, seen in the comp shots that accompany. So ultimately though the previous Sao had a more complex outfit and a selection of accessories, I’d say if you’re torn between the two, this is the one! 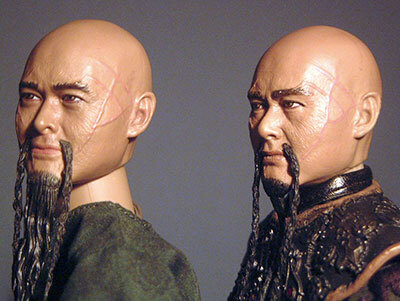 Both figures have great paint app’s but Sao nudges ahead in my opinion, but that’s probably because he’s an easier job, don’t let me downplay how well he’s done, but with no hair, apart from the whiskers on his face he was always going to be an easier figure to make look convincing at this scale. There’s still some great work on his skin and though I liked the previous version of Sao, this one shows far more subtlety, especially around the eyes. His overall facial skin tone is a tad darker, only by a few percent, but enough to bring his over all palette with the hands and feet into closer alignment, the body could have done with being a few percent darker to compensate for this but isn’t too noticeable in most poses. Elizabeth’s paint job is also very strong, but has a few small issues. The over all paint application is fantastic, the eyes and mouth looking exceptional. My only problem is her skin tone looks like it should be about 5% lighter, but this leads onto the next issue. The hair tone looks too light; maybe if the hair had been a bit closer to the way it appeared on screen, i.e. a bit darker and a bit more treacly and mousey with a greater variation in its tones. You can see how hard it’s going to be to paint as I’m even struggling to describe it. Blonde hair, in it’s ever changing reaction to light and shadow is surely one of the hardest things to capture convincingly with paint, and though this is a damn fine paint job the hair colour isn’t quite there. Elizabeth has the now standard HT female body, and it’s one I like a lot. I still have a soft spot for the old Takara Cy/Cool Girl body but the HT one has better articulation at the knees neck and torso as it’s a hidden armature under a rubber formed torso, if you have Ripley or Vasquez from the HT Aliens line you’ll know what to expect. I especially like the rubber cover over the body as it means when twisting or bending the abdomen it poses very naturally. The only problem is as good as the base body is the costume and armour hampers a lot of her pose-ability. I also found the right knee on mine to be a little loose, not floppy loose, just not as stiff as the other. She still stands fine though. Sao comes with the HT TrueType body, it has a fantastic range of movement as we expect from high-end 1/6 bodies. The last version suffered from a severely restricted range due to the armour. 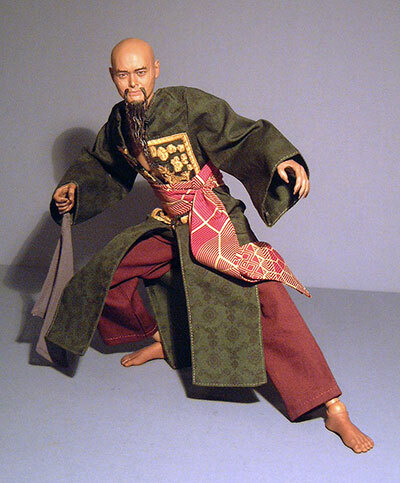 This time Sao is just wearing trousers and a tunic/robe so you’ll get a much better chance to put in some more extreme poses, I also found the feet to have a much firmer joint so he stands better as well. 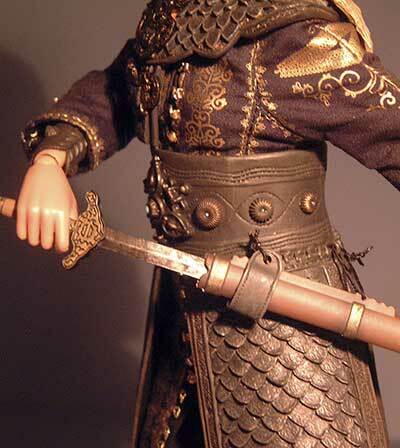 Elizabeth comes with her hat, Sao’s necklace, a scabbard, sword and stand. The hat fits well but looks a little big, not ridiculously over sized too big, just marginally out of scale to accommodate fitting over her hair, (though I have to admit mine will be displayed sans chapeau anyway). 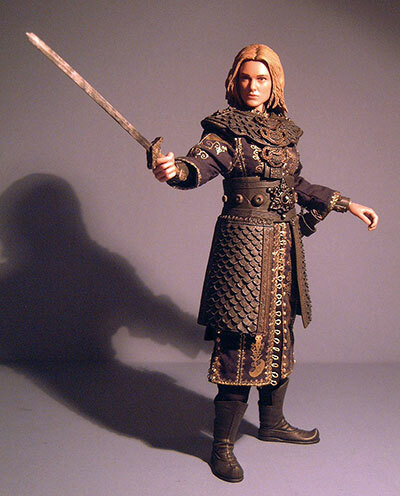 Her scabbard and sword are however fantastically sculpted and the sword fits her hand OK, but the hand-sculpt could have done with being a little tighter to grip it better. The scabbard has to be tied to the belt, not a difficult job, just fiddly. Part of the reason for Sao’s smaller box and lower price is evident in his accessories as he doesn’t come with any; well that’s not strictly true as he has a stand, but you don’t get anything for him to hold or interact with. True he has his necklace, one of the nine pieces of eight, the gift that he gives to Elizabeth making her captain of his ship as he is under the belief that she is Calypso, but he’s wearing that in the box so I consider it part of the costume. But the thing that has become apparent with the MMS range is they base the figures very closely on specific scenes from movies, and in the scene where Sao tries to seduce Elizabeth the only thing he interacts with is a flower in a dish of water, which I suppose they could have included, but personally I’d rather have the box and accessories paired down and save over $20. 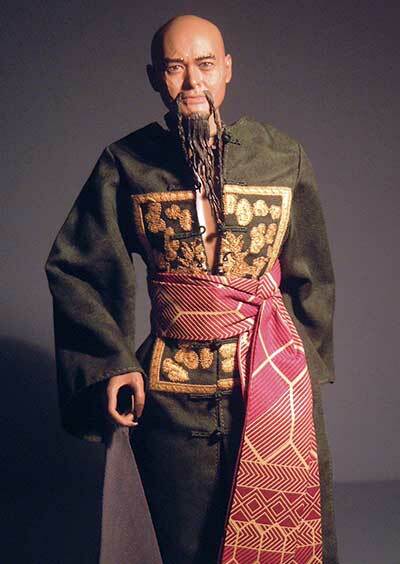 Some people may want to switch the Sao heads over though, as in the scene when we first get introduced to his character he is wearing the outfit from the first release and his beard is ‘un-tied’ (the figures is tied) and in the seduction scene he wears the new outfit but his beard is tied (the figures is flowing free…?) so you purists out there might want to swap. The one accessory I feel has been omitted in both Sao releases, is his map and map carrier, this would have looked great with V: 1. 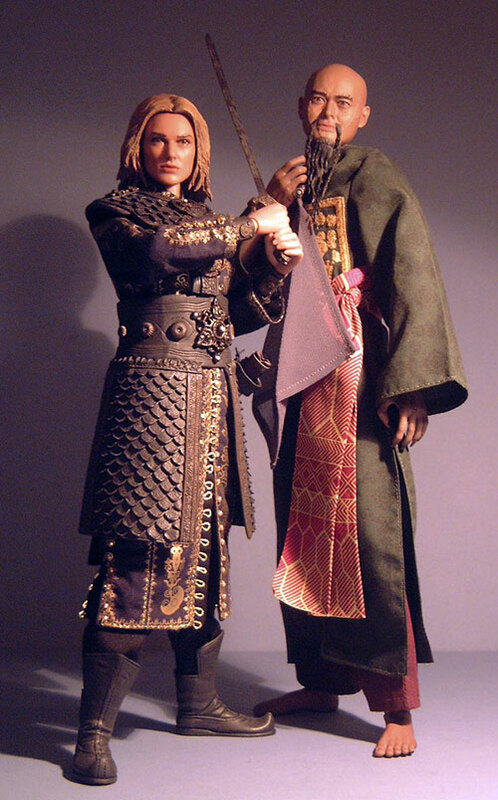 Sao’s outfit is far less complex than his last, but even though simpler it is carried out faultlessly. 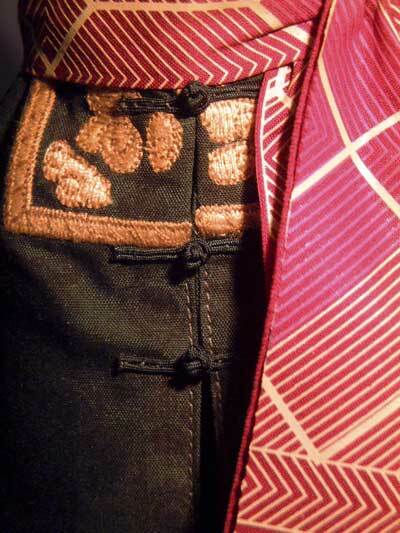 He comes wearing trousers; an embroidered tunic with Chinese style buttons (in the movie it is undone to the waist, whoa easy tiger!) 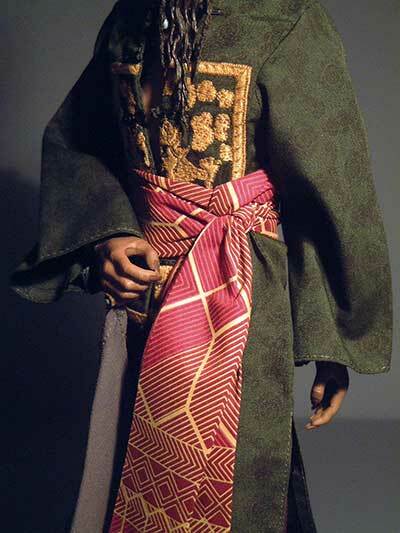 Around his waist is an embroidered brocade sash. This has been tied so well, with a knot that seems to look at near perfect scale, so there is no way I’m ever untying it as I’d never get it he same again. From his right hand he has a scarf that hangs from his ring, this time grey, as on the last figure it was red. Lastly he comes with the necklace mentioned above, it’s a nice sculpt but could do with being a few millimetres longer so as to hang lower on his chest. 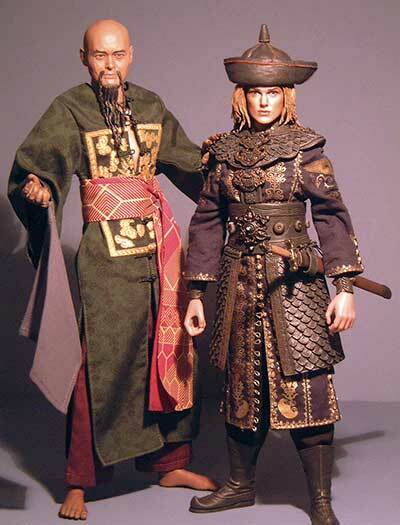 Elizabeth’s outfit is almost as complex as Sao’s original one, she comes with moulded boots, black trousers, a brocade and gold print tunic style coat with working Chinese beaded buttons, gauntlets, an ornate belt attached to thigh armour and ornate upper body armour in the form of a yoke and lastly her hat The fine sculpting work on the armour is fantastic and is just as good as Sao’s. If you remove her head you’ll see its pretty easy to lift the top section of the armour off, this then exposes more of the fine work on her tunic that is sadly never going to be seen by many. I can say categorically I personally will not be trying to remove the lower armour as it’s laced up the back and I just know I’d never get it to look as good again. 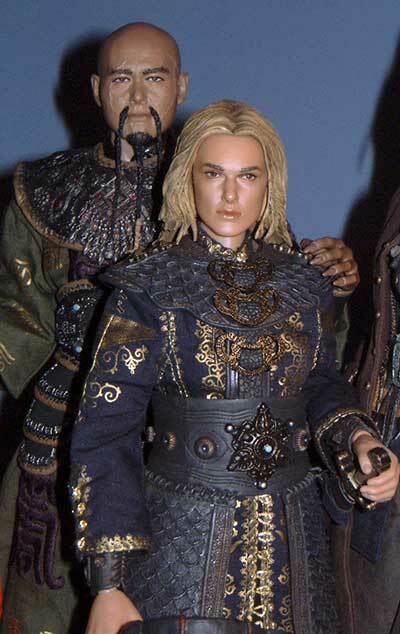 If I had criticise anything it would be that Keira’s figure is so sylphlike, that even when she’s in the armour on screen her silhouette is very slim, with a plastic figure and rigid armour that kind of silhouette was always going to be nigh on impossible to achieve. This is still a most excellent approximation of her outfit so top marks. As I always state, these are not toys, they are obviously intended as collectables to display, so if you’re a fan of the movies they are both at the top of their class. When HT have fleshed out the range with a few bad boys this line is going to make for a very strong display. SST have Elizabeth in stock for $124.99, they also still have both Jack and the original Sao for $134.99. The new Sao is a Far East exclusive so eBay is your best bet in the US or Europe, most prices seem between $90 and $99. I see eBay also has a number of the already released figures for between $99 to $125 with both the new Cannibal Jack and Will Turner available on pre-order. Two more fantastic sculpts from Yulli, in many ways these are both top mark figures, but the issue with the paint apps on Elizabeth’s hair just keep her from that perfection, Sao on the other hand is near perfect and sadly that means when these guys all finally share a shelf together it’ll be this new Sao that takes centre stage with V: 1 pushed slightly to the back… but only slightly. For Sao you’ll have to try Blister or hit eBay. Michael's Spnosor MyAuctionLinks helps find stuff on ebay as well. Figure from the collection of Jeff Parker.